Aruna Udayashantha alias ‘Ranale Samayan’, the prominent underworld figure who was murdered yesterday, told New paper Lankadeepa in 2015 that he never wanted to become a thug. 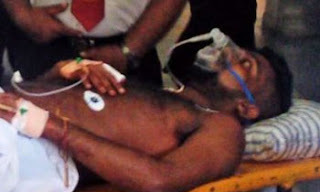 He expressed this following a telephone interview with Lankadeepa in October, 2015, weeks after he was injured when a gunman opened fire at him inside the Kaduwela Court premises. Q; Can I call you Aruna or Samayan? Q: But why do everyone call you Samayan? That is a nickname coined by my friends, for my mischievous ways. Q; You wanted to become a thug, didn't you? Q; What is your home town? My birth place is in Polonnaruwa. I came to know about it only recently. Q; Is it true that your father and mother were teachers? Yes that is true. They adopted me. Q; Have you got any brothers or sisters? Q; Where did you study? Q; What was your childhood like? When I was five, I lost my father. My family had enough properties. Everyone tried to grab our properties because I and my mother were the only inheritors to them. They created problems for us. When I tried to speak against them, they cornered me labelling me as an adopted child. Q; Did any relatives help you? No, never, they all cornered me and my mother. Q; What happened to your studies? Yes, Sinhala and Maths were my favourite subjects in school. I had to face more problems during that period. Everyone tried to chase me and mother from the village. I was assaulted on several occasions. One day my mother got a letter asking Rs. 300,000 as ransom. They threatened to kill me if my mother failed to give the money. My mother got upset about it and lodged a complaint with the Nawagamuwa Police station when I was seven. If you check the police complaints book during that period, you can find it. Q; Haven’t you told these things to a teacher in your school? At that time, I had so many friends. My mother tried to separate me from them. Q; Did you think of earning some money at that time? No..No.., because my mother treated me well, we owned shops. Q; Did you have any love affairs? I had several, but those were not serious, because the mindset I had those days due to the problems I had to face. I did my O/L in 2004. After that I was always away from the house. Q; When were you arrested for the first time? Q; What was the reason? I was taken into police custody for being near a group, which possessed a weapon. Then police charged me for possessing a bomb, which I never did. That was the turning point in my life. Q; What thoughts welled up in your mind when you were arrested? I was beaten by the Police for three months. I felt scared, I remembered my mother. She used to visit me regularly to the Police station and because of that she suffered a leg problem. She is still suffering from that. The Police should take the responsibility, for my position today. Q; When was you released? Yes, in 2014, I got married and now I have one child. Q; How do you see your child’s future? I will never allow my child to fall into my society. I only have my mother, wife and the child, and no one else. Q; Is it true that your rival gang is getting political support? Q; Did you help any politicians? Not me. May be my friends helped some politicians. Q; Have you thought about reforming yourself? I wanted to change my life, but I can’t. Problems were coming after me. I wanted to have a peaceful life overseas with my wife and child. I was seriously thinking about changing my life, at that time I was shot near the Kaduwela Court. I was shot because I asked everyone to stop selling drugs. My supporters were murdered. Q; You are only 36. Have you felt you reached this position too fast in your life? I was made to come so far too fast by this society. I never did such things that were being rumoured. I retaliated to those who attacked me. Q; If something happens to your life? I still have my home environment. I did attack only those who attacked me. I am a respectable boy hailing from a respectable family. I want to guide my child and show him the right path. I will not allow my child to become a person like me.